You can remove pictures in several ways. 1.For delete one picture, just click this picture to select it, then press Del key. 2.If you want delete several pictures one time, you can check them first by click the checkbox or select the picture then press SPACE, then select Delete Checked from main menu. 3.If you want delete many pictures and remain a little, you can check the pictures you want remain, then select Invert checked from main menu, then select Delete checked from main menu. 4.You can remove a task from project, the pictures belong to this task will be delete. 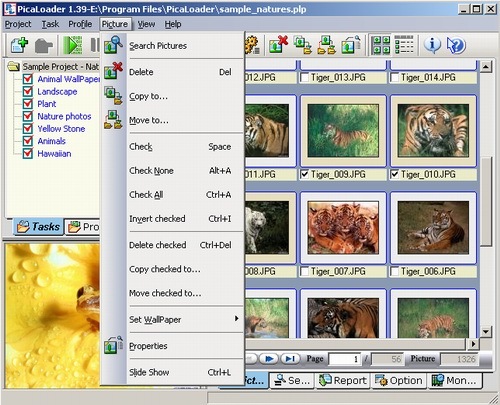 5.When delete picture, PicaLoader will remove the picture file from your disk, but it will remain a record in project database, so when you download the project next time, the pictures that you had deleted wouldn't be download. If you want PicaLoader re-get the pictures that you had downloaded, you can select Database/Optimize project data from project menu, then start the project.